Ryan Lott is not only gifted, he’s a giver as well. 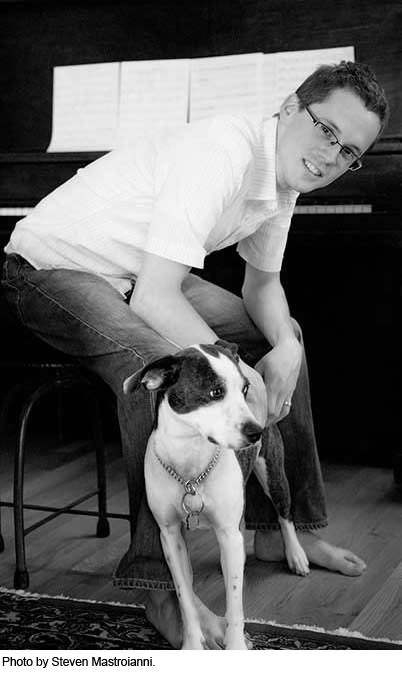 A solo pianist trained as a composer, Lott’s real passion is collaboration. Not only is he one-half of the funk/hip-hop duo 2% Milk, he is currently involved in several recording projects with musicians from around the country. He collaborates with New York and Cleveland dance companies and produces a large-scale, multi-media production called CONNECT, which involves up to 30 artists working together. And at his own expense, Lott produces CDs of the CONNECT performances and sells them to benefit food programs and shelters, from Cleveland’s City Mission to victims of the 2004 Tsunami and Hurricane Katrina. Lott’s recent creative partnerships with choreographers and dance companies include Gina Gibney Dance (NYC), At Marah Dance Theatre (Philadelphia), Steve Rooks (formerly of the Martha Graham Dance Co. (NYC), Inlet Dance Theatre (Cleveland), Groundworks Dance Theatre (Cleveland), and Dance Ad Deum (Houston). Lott grew up studying diverse compositional and performance styles—from classical to rock to jazz—and earned his Bachelor of Music in Composition degree at Indiana University School of Music in 2001. In 2005, he received an Individual Artist Fellowship from the Ohio Arts Council, and his music was recently featured in the Works & Process Series at the Guggenheim Museum in New York City. Also in 2005, with his dancer/choreographer wife Jennifer, Lott co-created Wake Arts Collective, a ministry extension of the Christian/arts organization Blue Renaissance Creative Group, a group of artists who use their talents in a ministry out of Colorado. With his youth, talent, networking and passion for music, it’s doubtful there will be many restrictions Lott will encounter in the years ahead—unless they’re his own.